I seem to be doing well at keeping the site updated, shame about my lack of events this year, I’ve totally failed at booking for the MCM Expo in Oct. So if anyone has a table they’re willing to share, drop me an email. I’ll repay you in love and cookies, mostly cookies. Not one for buying crappy musical cards from Clinton cards, I usually end up drawing my cards for friends birthdays. Here’s one I recently did, based on the old Creature from the Black Lagoon poster…I have a sneaky feeling it would look awesome if I coloured it in. Oh, on the inside of the card is said “have a monstrously good birthday” …good pun right? 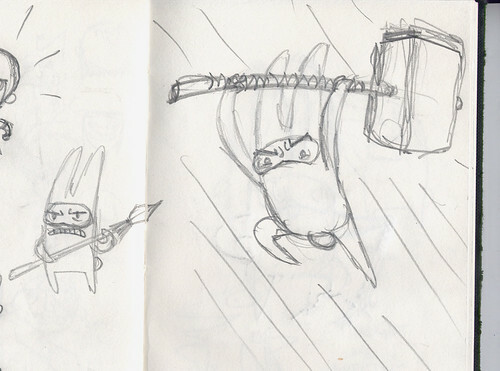 Here’s some old fan art from the MCM Expo (which goes to show how lazy I can be at scanning sometimes). A ‘what if’ Miss Noonan met Ninja Bunny. 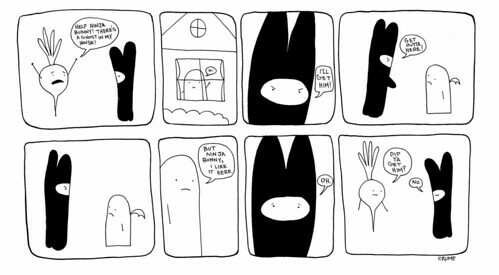 If you have no idea what/who Chloe Noonan is, then I suggest you visit Marc Ellerby website and buy this fantastic comic. 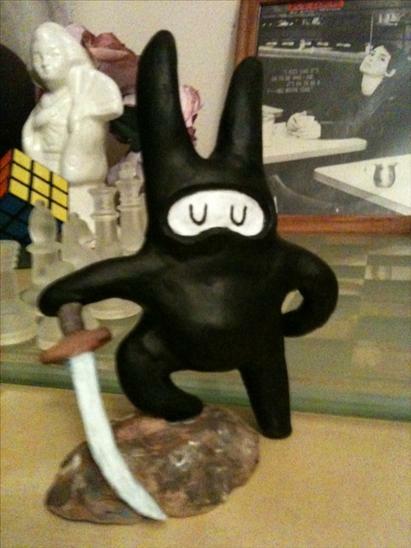 It’s pretty rare I get fan art, so I was bowled over when I got this rather lovely picture in my inbox yesterday, a Ninja Bunny sculpture, made by Terry Blas, who just so happens to be a friend of Marc Ellerby. Oddly, it’s based on one of James Turners skeches of Ninja Bunny. 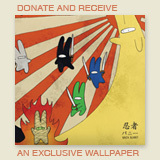 If you’ve any fan art of any kind, email me: phil at ninja-bunny dot com and I’ll post it up for all to see. You all know that pretty boy Marc Ellerby right? If not you should check out his autobiographical story Ellerbisms. He’s just celebrated his 200th milestone strip. With that he’s had a week of guest art. You can view my story of Dracula (the dinosaur balloon) over at his website. As you may have noticed, there’s one again been another lack of updates, mainly because I’ve been working on my Solipsistic pop anthology submission, which is an 8 page monster Ninja Bunny story, drawn in A4…which is a real first. I’ll tell you more about that when there’s something to show. But to placate you, there’s a glowing review of the WAW+P stall in Bricklane, of which my ‘Reasons..’ comic gets a lovely mention. 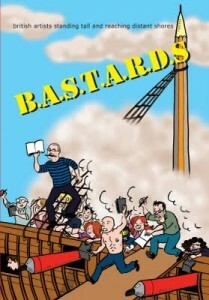 Also, the rather Inglorious, B.A.S.T.A.R.D.S anthology is weeks away from being sold. Standing for British Artists Standing Tall And Reaching Distant Shores, it is an anthology put together by Francesca Cassavetti and Dan Lester for this year’s French Angoulême international comic festival. Featuring stories from a dozen talented British artists like Sean Azzopardi, Paul Rainey and Oliver Lambden to name a few, in addition to 3 stories from myself. Keep your eye out for it! I thought I’d bring you some bunny art from around the web, Here’s a fantastic Ninja Bunny drawing by Simona, check out Simona’s website for regular bunny drawings. Today (if you didn’t know) is Grizzly Bear Thursday, a fantastic bear meets art website run by Lizz Lunney. Today features a guest drawing by me. I suggest you go take a look! That’s right, he’s getting OLD. But I couldn’t let the little one turn 4 without giving you guys something. So, since I’m off being busy this weekend I’ve dug out an old unused (but still fantastic) guest strip, from way back in ’07 by Crump. One of the first people who encouraged me to get into comics, so many thanks to her for the initial push in the right direction. Thats all for now, check back Monday for the regular comic strip. Tomorrow is Ninja Bunny’s 4th birthday, exciting stuff. They’ll be parties, cake, the usual. Unfortunatly due to all this merriment they’ll be no Ninja Bunny today. But seeing as the last update was Wednesday, I don’t think it’s all that bad. Actually it’s really because my computers graphic tablet is playing up and it’s a pretty detailed piece so I wont be able to get it coloured in time. 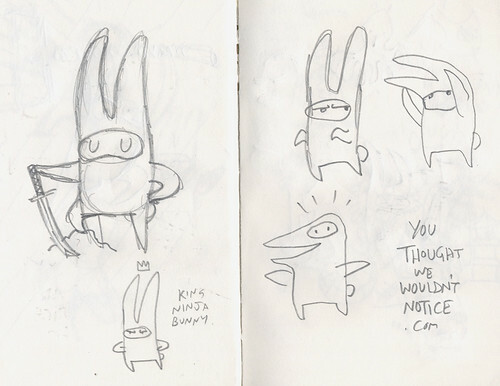 Instead you can make do with some sketches of Ninja Bunny done by James Turner, and yes, in one of the sketches Ninja Bunny morphs into Steve of Beaver and Steve fame. Thanks to everyone who’s been reading since the start (if any of you exist) and to everyone else who’s helped support me or even just liked what I do. EDIT: Don’t forget to check back tomorrow, I’ve set up an automated post with a ‘golden oldie’ guest strip. If you want to get your hands on these comics they’re all avaliable to buy from the shop. If you’ve missed the FPI previous reviews, then there’s also a review of The Adventures of Ninja Bunny: Paws vs Claws and a review of the Ninja Bunny webcomic.